Well he's not going to be our best player, but he's going to be on the level with Mike and Marc. It's something to think about, but that is a heck of a price tag. It depends on how much Pera wants to win. If we got John Wall we would definitely be a more legitimate team to win it all. I would definitely bring in Sam Cassell as a coach if we brought him in though. Sam-i-am seems like he has a good relationship with John Wall. I do remember you saying the same thing about zbo when he came to the Grizzlies. I just don't know man it's it's iffy. you do it if you really really really I mean really we believe the John Wall can turn it around. My only concern is "who is responsible for the toxic environment"? If it's JW, that could turn us into an imploding team, so it's a bit scary, but IDK, maybe worth a shot? I also think that if we brought in John Wall it needs to be an entire organizational decision. Pera needs to have a meeting with Mike and Marc, but especially marc and ask him if he would be willing to take less money on his next contract if we brought John Wall in. JB Bickerstaff needs to be involved to determine whether or not John Wall and Bickerstaff can get along. I hate to say that we need to interview John Wall because it seemed it would be like we were questioning him or something but we might need to do something like that. Wall is a hell of a defender when he's motivated and him and Mike would be unbelievable. Well him and Mike and Marc Gasol. John Wall playing off Marc Gasol all would be deadly. You think trying to stop Mike Conley and Marc gasol's pick-and-roll try stopping John Wall. Again there's an upside there but the contract is is outrageous. John Wall would be a great get, by why would the Wizards agree to this? The only big downside to this proposed idea is that IMO Wall needs to be better at hitting 3's to be worth the money he gets now and will be getting. Other than that heck yes. People need to wake up and smell the coffee. What the Grizzlies are doing now is half arsed. They aren't doing a proper rebuild and they aren't able to truly compete. The only free agents signed is because they are injured and /or the rest of the league doesn't want them. Crap or get off the pot as Grandpa used to say. A backcourt of Conley and Wall could be pretty awesome. I believe that Wall is definitely the guy the Wizards want to dump, not Beal or Porter. It's been reported that the Wizards still have a pipe dream of getting Durant. A couple of days ago we were talking about it in roster moves thread. John Wall is not worth 200 million regardless of a hits threes. 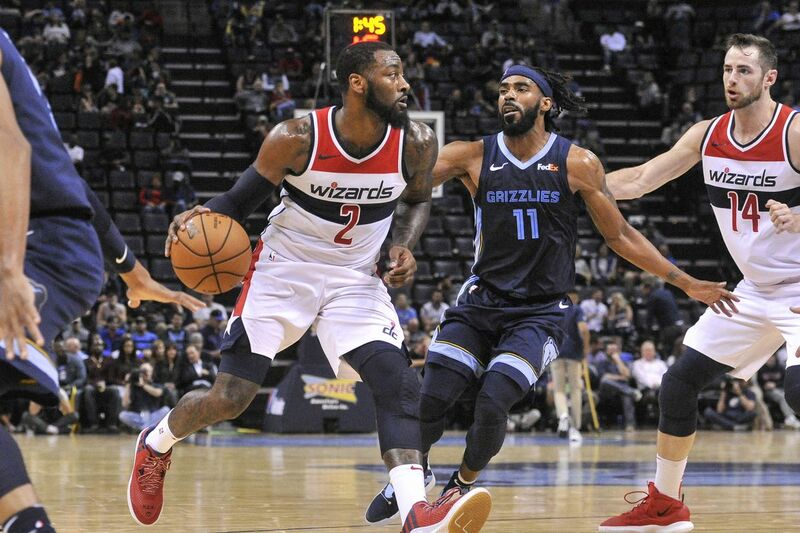 If people are up in arms about Conley getting 150 million, and all he's done is try to live up to his contracts, please don't act like the out-of-shape John Wall is worth 200 million give me a break. But at the same time he's such a step above what we have that it might be worth it just to bring him in in order to compete for a championship. But and no universe is John Wall worth 200 million. I just think that the Wizards would be wanting more than that for an All-Star. Are they that desperate? I would expect them to demand JJJ (out of the question) in addition to Parsons. Funny note, Trade Machine shows us paying Noah $18.5M per for two seasons. Of course he isn't worth 200 million, but it should be a no-brainer to be overpaying an all star caliber player than overpaying Parsons who contributes absolutely nothing. The F.O. will not do a rebuild, so overpaying Wall is the only true option for this team to honestly compete. i like it ... kind of lol .. trade,talent etc are great i'd be more worried if marc will give a discount and bringing in FA or who we have bird rights for . I want to see what fanboy slim says about our books after we signed him. I'm assuming we would lose jamychal green for sure. Maybe Garrett Temple will sign like a minimum contract or something. if the Grizzlies could swing this and still stay under the luxury-tax then it probably is a no brainer. but if we become a taxpayer because of him well that's kind of that's not good. What figure does his contract jump to? Marc would have to be on board with it. He would need to opt out and sign a long term deal for less per season. Jam and Temple are probably gone. Bright side, the Grizzlies suddenly become a destination for future ring hunting free agents. 37 to 40 mil per season for 4 years. Man he is toxic and doesn't he thrive in a fast paced offense? No way he would be effective in our halfcourt slow paced team. Personally, I'd rather just got after Tim Hardaway or Kent Bazemore. At least those guys play true position of need and aren't known as cancers. if we cant keep jam & temple maybe one of them should just be sent out in the deal . Gee, depending on how much the cap/tax increase next season, doesn't that leave us with about $10M-12M to try to fill 8 roster spots for 2019-2020 and still stay under the tax? That's a lot of minimum contracts. That's Gasol, JJJ, Anderson, Wall, Conley with a bench of DBrooks and JCarter. What's the fewest you can carry on the main roster? Wow. For John Wall, fully guaranteed? Hard Pass for me. He is, at best, a 1x All-Star in the West, and that's a lot of money to pay for that long. However, if they want to take Parsons and fluff, I'm fine.